Water comprises more than 60% of our body. Blood is 92 percent water, the brain and muscles are 75 percent water, and bones are about 22 percent water. We can survive a month or more without food, but only about a week or so without water. Our society’s consumption of non-water drinks is tremendous and continues to increase. Drinking enough water is just as important as eating the right foods. There are many harmful effects of even mild dehydration including headaches, constipation, fatigue, muscle cramps, dry skin, irregular blood pressure and kidney dysfunction. Some people wait until they are thirsty to drink water. Did you know you are already about 12% dehydrated when you are thirsty and the risk of death occurs at 20% dehydration! Another sign of dehydration is dark urine and low urine volume. Water has many healing capabilities. Increasing water intake will reduce fluid retention and bloating. When the body is dehydrated it stores water and toxins in our tissues. Drinking water helps you lose weight because it flushes out the by-products of fat breakdown. It’s also an effective appetite suppressant by reducing hunger so you’ll eat less. Plus, water has zero calories. Water improves your immune function especially when lemon juice is added. Lemon is an antiviral and antibacterial. Water consumption is very beneficial for healthy skin. Acne and blemishes are markedly improved when the skin is well hydrated. Toxins are excreted instead of surfacing on the skin. Dehydration will also cause fatigue. Your heart would need to work harder to pump out oxygenated blood to all cells and vital organs. This would make your heart and organs work harder; therefore, causing fatigue. 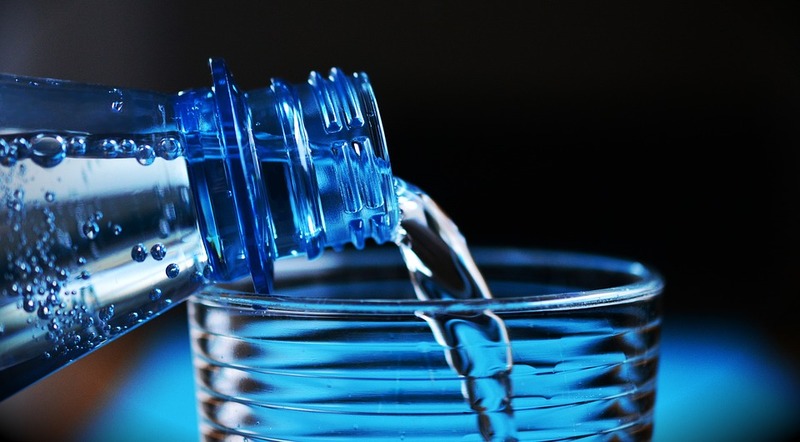 Related to the digestive system, some studies show that drinking a healthy amount of water may reduce the risks of bladder cancer and colon cancer. Water dilutes the concentration of cancer-causing agents in the urine and shortens the time in which they are in contact with the bladder lining. So how much water should you drink? The old addage of drinking eight 8 oz glasses of water is only suitable for a person who is 132 lbs who doesn’t exercise regularly and doesn’t drink diuretic-type drinks such as caffeinated and alcoholic beverages. A rule of thumb is to divide your weight in half to equal the number of ounces you should consume daily. Increase the amount of water to compensate for alcohol and caffeine consumption and exercise. So, a person who weighs 160 pounds should drink 80 ounces of water or about 5 half-liter bottles of water. I encourage you to buy a measured container (preferably non-plastic) so you can keep track of your consumption throughout the day.